Choose a package deal today, or contact us to request an estimate on a customized design for your home. We purchase and maintain the lights and decor. 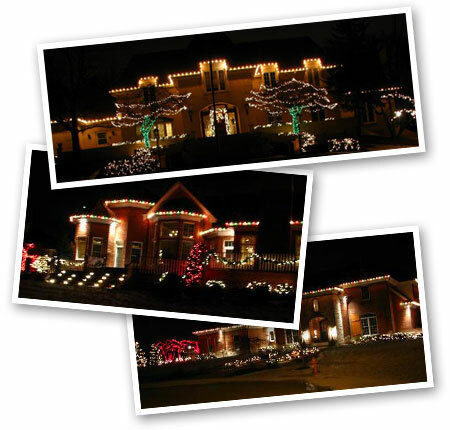 Our professional, trained crew installs your custom Christmas design. Our crews are properly supervised, insured and trained to ensure that you get a beautiful holiday look! We provide maintenance service for your design throughout the season, including two free service calls with a minimal ten dollar fuel fee for any other service call you request. Once Christmas is over we come back out to take the lights down for you. We then store all of our materials at our warehouse until the next season. This process spells out a hassle-free holiday for our clients!